A keloid is a firm, irregularly shaped, fibrous, hyperpigmented, pink or red excrescence. keloid is an abnormal proliferation of scar tissue that forms at the site of cutaneous injury (eg, on the site of a surgical incision or trauma); it does not regress and grows beyond the original margins of the scar, it protect the injury. Keloids should not be confused with hypertrophic scars, which are raised scars that do not grow beyond the boundaries of the original wound and may reduce over time. A keloid usually takes time to appear. After an injury, months can pass before this scar appears. A keloid can also form more quickly. Once it begins, a keloid can enlarge slowly for months or years. an itchy patch of skin. While keloid scars may be itchy, they’re usually not harmful to health. Anyone experience discomfort, tenderness, or possible irritation from clothing or other forms of friction. In rare instances, may experience keloid scarring on large areas of body. When this occurs, the hardened, tight scar tissue may restrict movements. Keloids are often more of a cosmetic concern than a health one. Anyone feel self-conscious if the keloid is very large or in a highly visible location, such as an earlobe or on the face. Sun exposure or tanning may discolor the scar tissue, making it slightly darker than surrounding skin. This can make the keloid stand out more. Keep the scar covered when sun expose to prevent discoloration. Dark skinned people get keloids easily than those with a paler skin. They are common in people with black skin. Keloids can crop up anywhere but do so easily on certain areas, such as the skin around the upper chest and shoulders – particularly over the breastbone (sternum) – and on the earlobes. Wounds that are under tension while healing, or which get infected, are particularly likely to form keloids, as are burn and acne scars. Having previously had a keloid increases the risk of getting another if subjected to trauma to skin. Keloids tend to have a genetic component, which means anyone likely to have keloids if one or both of parents has them. Keloids most commonly arise between the ages of 10 and 30 years. Keloids are not contagious and have a very small risk of turning into skin cancers, which is more likely if they are treated with radiotherapy. 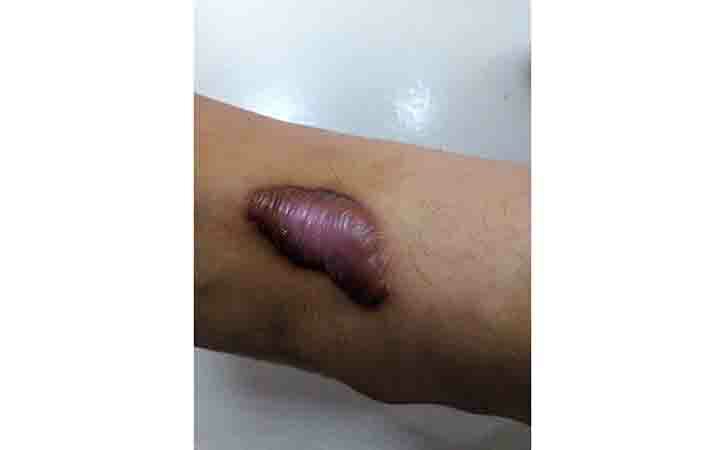 Injection of 10-40 mg/mL of triamcinolone acetonide (Kenalog) into the fresh site of scar excision with a 25- to 27-gauge needle at 4- to 6-week intervals until the scar flattens and discomfort is controlled. Injections of a steroid (triamcinolone) into a keloid may help to flatten small early ones. Steroid-impregnated tape applied for 12 to 24 hours a day may help to flatten keloids. Freezing with liquid nitrogen may also stop early keloids from growing. Putting a silicone sheet over them at night for several months helps some keloids to flatten. Silicone in gel form is also available. Long-term compression with pressure bandages sometimes helps too. Radiation can be used as monotherapy or in combination with surgical excision in order to prevent recurrence. The advantage of laser therapy is that it is a precise, hemostatic excision with minimal tissue trauma, thereby eliminating an excessive inflammatory reaction. The different modes of laser therapy are flash lamp pulse-dyed laser, carbon dioxide laser, argon laser, and the Nd:YAG laser. Laser treatment makes keloids less red, but does not make them smaller. Simple excisional surgery should involve the least amount of soft tissue handling to minimize trauma; also, plan the closure with minimal skin tension along relaxed skin tension lines. If a keloid is cut out, it usually comes back, and may end up larger than before. This risk falls if the area is treated after the operation with pressure dressings or local steroid injections. Cryotherapy uses liquid nitrogen to cause cell damage and to affect the microvasculature, causing subsequent stasis, thrombosis, and transudation of fluid, which result in cell anoxia. Cryotherapy used 1-3 freeze cycles lasting from 10-30 seconds, repeating the therapy every 20-30 days. One of therapeutic modalities is intralesional injection of INF-alpha, INF-beta, and INF-gamma. Sometimes, 5-fluorouracil and imiquimod are used to reduce size either alone or before using other types of treatment. 5-fluorouracil (5-FU) injected intralesionally has been successfully used to treat small keloids. Flurandrenolide tape (Cordran) used on a formed keloid will cause it to soften and flatten over time. This is placed on the keloid for 12-20 hours a day. It is also good at eliminating pruritus. Bleomycin (1 mg/mL) is used with success to treat small keloids. Tacrolimus is a treatment for keloids given twice a day. Methotrexate has proven quite successful in preventing recurrences when combined with excision. Dosing is 15-20 mg given in a single dose every 4 days, starting a week before surgery and continuing for 3 months. Keloids don’t require medical attention, but may want to contact a doctor if growth continues, if develop additional symptoms, or if anyone want to have the keloid surgically removed. Keloids are benign, but uncontrolled growth may be a sign of skin cancer. After diagnosing keloid scarring by visual exam, doctor may want to perform a biopsy to rule out other conditions.